Complete hybrid systems with integrated energy storage are very simple to install and offer an attractive solution which eliminates the need to select and match individual components. These systems generally combine a battery inverter/charger, solar inverter, battery modules and energy managements system in one unit or 2 separate modules. All available systems at this stage use lithium-ion batteries but only the Fronius, Alpha and TrinaBESS systems are upgradable to enable future expansion. These all-in-one systems may be very convenient but they do have some limitations, the main being the limited inverter power output during a blackout and no pass-through power capability. This mean your home may require separation of essential and non-essential loads. Also be aware that some of these systems (Samsung) have no UPS function so no power is available during a blackout, although if grid outages are very rare then this may not be an issue. The following list explains in detail the features and specifications of the various hybrid systems available. Also see the full hybrid inverter and energy storage system summary list here for easy direct comparison. Suntellite Group headquarters is located in Zhejiang University with two major manufacturing plants, 14 laboratories and five engineering research and technology centers throughout China. SolaX Power a subsidiary of the Suntellite Group manufacturers solar cells, panels, inverters, solar racking and LED lighting technology. Peak power output 1.5 x rated output for 10sec. Uses the well known Pylon Tech lithium LFP batteries. Fronius International is an Austrian company which began in 1945 designing and building welders. Fronius is now highly active in solar photovoltaics and battery charging technology. 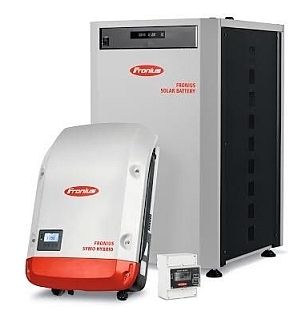 Fronius and Tesla partnered to offer the Powerwall 1 in combination with the Fronius Symo Hybrid inverter as an integrated solution for residential PV systems. Since the Powerwall 1 is now discontinued the system is only compatible with the Fronius solar battery. 3-phase inverter only - single phase to be released late 2018? back-up power enabled via "emergency power button"
Phase loads need to be balanced - limited applications. Sonnen is successful German company founded in 2010. Previously known as Sonnenbatterie, Sonnen has become a leader in developing high quality, modular energy storage systems for residential and commercial applications and is planning to build a new battery manufacturing plant in South Australia. AC battery - requires an additional solar inverter to be AC coupled. TrinaBESS or 'Trina Battery Energy Storage Systems' is the battery company under the global panel manufacturing giant Trina Solar. TrinaBess supply a large range of solar hybrid and retrofit battery solutions for on-grid, off-grid, residential, commercial and micro-grid energy storage systems, from 4 kWh capacity up to a massive 2 MWh capacity. 5.0kW solar inverter with up to 7kW max solar array size. Not technically a complete system - requires an additional solar inverter to be AC coupled. AlphaESS based in Jiangsu, China, have been developing economical energy storage solutions since 2012 and have distributed products in European and Australian markets. The latest is an integrated smart energy management system including hybrid inverter and battery modules in one complete unit. All-in-one unit including, inverter, batteries and system management. IP65 weather rated for outdoor use. Built on the well known Goodwe hybrid arcitecture. AU Optronics (AUO) is an international company with global operations spreading across Taiwan, China, Japan, Singapore, South Korea, USA, and Europe. AUO's solar business has been adopting BenQ Solar as its brand name to offer high efficiency, reliable solar products that are easy to install. All-in-one unit including solar inverter, batteries and system management. For direct comparison of all inverters & systems see the complete Hybrid Systems and Inverters Summary page.